The Golden Age of Aviation (1926 thru 1947) has sometimes been called the “Forgotten Years” of aviation. This is the only time in history that the restoration and completion of a propeller collection from this era and to this extent and rarity has even been achieved. A collection like this does not exist anywhere else and will never exist like this. Of the 112 propellers that comprise the entire collection, twenty-six are rare, one of a kind and New old Stock (NOS) propellers. These propellers are like finding a time capsule of this period of aviation. The Smithsonian national Air and Space Museum (NASM) has commented on the quality, condition and rarity of the NPJ collection. The following narrative describes a brief background of some of the various rare propellers included in the NPJ collection. ERCO Compreg propellers, (total of 6 in the collection), represent the complete manufacturing line of the retrofit propeller blades for the Hamilton Standard hub. Also one Fixed pitch propeller form the early 1930’s. • Three types of plastic impregnated and compressed hardwood propeller blades were produced for us with Hamilton Standard propeller hubs. These blades were designed in the early 1940’s to retrofit the metal blade of the Hamilton Standard Counterweight propellers as the alternative for the shortage of aluminum during war time. There were 2 designs of blades produced, 45” and 49” “B” shank in which 16,000 blades were built for the 2B20's Hamilton Standard hub. The primary use for this blade configuration was general aviation, military trainer and small transport planes. There are two 2B20 propellers with two blade designs in the collection. • The 3rd blade design in which only 600 blades were made for the “D” shank Hamilton Standard 2D30, 12D40 and 3D40 hubs. This “D” shank blade was used primarily on the Vultee BT-13 trainer and a few of the AT-6’s. Shortly after WWII the BT-13’were aircraft disposed of as surplus property and gifted to foreign countries. Along with the airplanes, the Compreg propellers disappeared. Numerous inquiries have been received from people in various European and South American countries about what aircraft this blade may have been used on. • One of three wooden fixed pitch manufactured in 1930 as a prototype with the scimitar blade design with a SAE 20 spline hub. • One of the first Freedman Burnham propellers from Detroit, MI with a S/N in the low 30s. • One of the early pre-patent Freedman Burnham props built in Cincinnati, OH at their new location. The propeller blades were constructed of the finest select grades of birch and imported African mahogany. These propellers were optional equipment and recognized for their beauty and design. • This is one of two propellers made specifically for the Curtiss RC-3R Racer in the 1926 Schneider Cup race. This is a left rotation propeller set up for the geared Packard engine. The engine had plenty of horsepower but made it difficult to handle and maneuver the turns.Since the introduction of the Freedman Burnham adjustable-pitch propeller at the Chicago Air Show in 1937, two propellers received type test approval from the Civil Aeronautics Administration; the Roby controllable pitch propeller and the EVEREL Automatic variable pitch propeller.In comparative tests Beech controllable propellers showed an increase in rate of climb and decrease of take-off run from 15% to 26% for the various types of airplanes on which it was tested. These propellers were made during the war for the Army Air Force and were used on the various fighting fronts and in the United States for small military trainers. • Actual and Original R-1, ROBY “prototype” Designed by Walter Burnham and H.Roby in the late 30’s early 1940s, this specific propeller is shown with a pair of Birch blades designed by Freedman Burnham and was autographed on 1-23-1942. Patent was given in April 1942. • R-100 Beech Roby propellers with blade serial number 1,2 and 3,4. Each with prop hubs that were not serial numbered for production. • An NOS R003 propeller for a Swift GC-1A. • The original R002 used on Ernest Kowalisky’s Army L-4J during WWII. This aircraft was an artillery spotter for the 5th Army 88th Division Artillery Head Quarters Battalion as a spotter aircraft. In 1945 Hartzell developed the world’s first composite propeller blade using a fabric-based plastic material (Panelyte), which was dubbed Hartzite. Hartzite is weather proof through and through, minor damages were not serious. Hartzite, a proprietary composite material, had the highest fatigue strength-weight ratio and the highest vibration-damping qualities of any propeller developed in this time. The Hoover Hydraulic was manufactured by Canadian Car and Foundry and the blades were manufactured by Singer Manufacturing in Winnipeg, MB using the ERCO manufacturing process. The museum in Hamilton, Ontario is home of one of the only restored Fleet 60 Fort aircraft and the propeller shown on the display aircraft is incomplete due to a broken blade. • There are two of the Hoover Hydraulic propellers in the collection. These propellers were designed for the Fleet 60 Fort trainer with only 101 of these aircraft built. Hoover also built the prop used on the Anson Mark-V.
First advertised as the “Propeller with a Brain for Tomorrow’s Plane”, the Aeromatic Air Controlled Automatic Propeller was licensed under patents of EVEREL Propeller Corporation, KOPPERS Col, Inc. Bartlett Hayward Division, Baltimore, MD. Walter E. Everets was the designed of the EVEREL Single Blade propeller. During the testing and experimental stages, Everets found that the single blade produced 25% greater thrust than the conventional two-blade propeller. Nearly sixty experimental full-sized blades and more than a dozen hubs and mechanisms were built and tested before the 40-horsepower model of the single blade was submitted for an Approved Type Certificate, which was received for the Taylor A and the J-2 Cub. This ground adjustable Aeromaster propeller was manufactured in the early 1940s and was type certificated for a Republic Seabee. • This propeller was used on the First Navy Interstate TDR-3 Unmanned Radio remote controlled bomber. • Also included is the Aeromatic F-200 with proto-type aluminum skin, wood blades. There were a number of propellers manufactured and licensed by the Everel Propeller Corporation in Baltimore, Maryland. This company was subsequently bought out by Univair Corporation and the manufacturing rights are now owned by Kent Tarver, Fallon, NV. The NPJ collection represents one model of each of their subsidiaries, EVEREL, Aeromaster Koppers Bartlett Hayward, Aeromatic Koppers Bartlett Hayward, Aeromatic Koppers Universal, Aeromatic Univar, and Aeromatic Tarver propellers. • This propeller is 77” in diameter and was first introduced at the New York National Aviation Show in 1937. It was claimed that the unique arc of the blades acts to bring the point of fatigue four inches closer to the hub, and that the offset blade arrangement provides better balance and reduced vibration to the engine. According to the NASM, this propeller is 1 of 3 known of in existence. Annesley 84” Diameter, the only information is the hub patent in 1945, the NASM is looking for more info. • The Micarta is a 102” diameter propeller built for the Curtiss OX5 engine. The Tri-Motor, Army Fokker C2-A and the Aristicat 102-E used this type of propeller. The Micarta propeller was also used on the first flights from San Francisco to Hawaii. 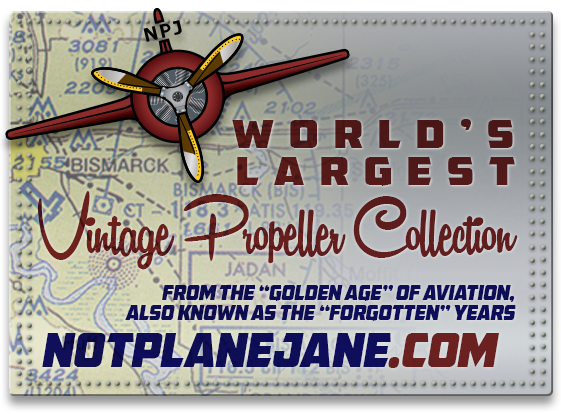 The above only briefly describes the twenty-six “one of a kind” propellers that are part of the larger collection. This collection consists of a complete representation of the propeller manufacturer’s transition from metal propellers back to wooden propellers during wartime. In the late 1920s and 1920s aluminum had been perfected for use for propellers blades. This collection represents a short lived era of wooden propeller blades (1937-1946) when, due to the aluminum shortages, the industry reverted back to designing the propeller blades with wood and using steel hubs for general aviation and small military training aircraft. The collection represents unique and rare examples from aviation history when the propeller manufacturers developed the adjustable and controllable hub along with the performance changes this made to the aircraft industry.